Last year we had a very limited release of our very first concrete egg Chardonnay. Long story short, the wine was stunning and we bought another concrete egg. There were quite a few people who wanted to try the wine but did not get a chance to, so we are offering another chance on futures for the 2017 Vintage. 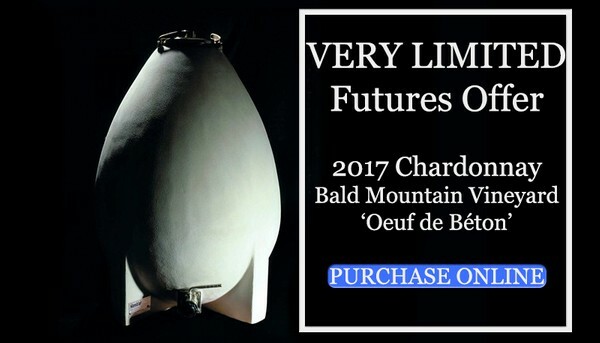 Futures of the 2017 Chardonnay Bald Mountain Vineyard 'Oeuf en Béton' (Concrete Egg) are now available to our customers. Futures will only be sold in six bottle increments for 33% off for club members and 15% off for non-members. We expect the wine to sell out quickly. New to wine Futures? Futures give you the chance to purchase a wine at a discounted rate before the final wine is bottled giving you the opportunity to stock your wine cellar. We expect this wine to be bottled this summer and available to be picked up January 2019.